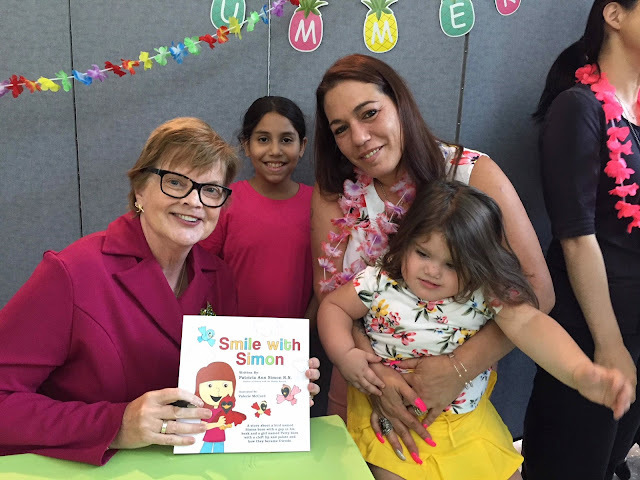 Author, registered nurse, and cleft lip and palate advocate, Patricia Simon, is spreading her message of acceptance and hope across the world. Earlier this year her children’s book was translated into Tagalog for kids in the Philippines taking part in a speech camp organized by Smile Train. 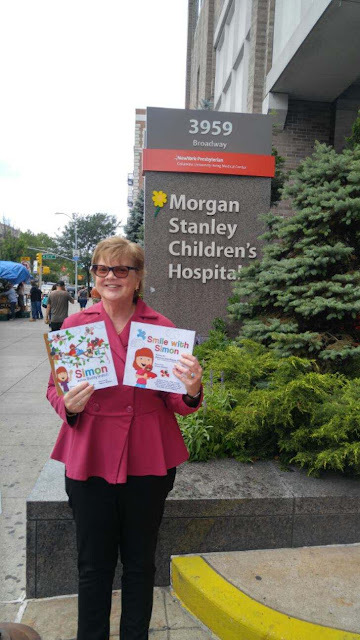 And just recently, at the beginning of September, Patricia delivered the keynote speech at New York’s Morgan Stanley Hospital Cleft Lip and Palate Team Day. The road to the keynote address in New York all began with an email. Two parents were interested in her books, Smile with Simon and Simon and the Buddy Branch about a cardinal named Simon that has a cleft beak, who seeks out acceptance and kind friends in both books. The family requested the books, sharing that they were unable to afford to pay for them. 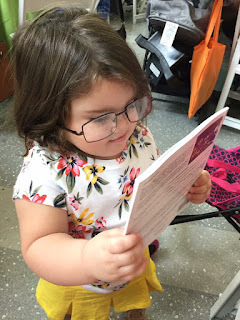 Simon sent the books to the parents for free, and enclosed an additional set for their surgeon’s office waiting room at Morgan Stanley Hospital. 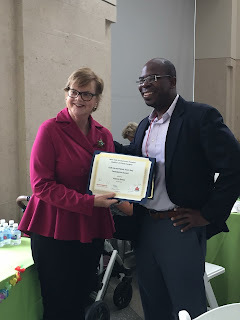 Plastic and reconstructive surgeon, Dr. Thomas Imahiyerobo picked up the books, read them, and wrote to Simon saying, “As someone who has dedicated a large part of my career to taking care of children with clefts, these books really spoke to me. The positivity that they exude and kind stories that they tell are exactly the outlook that I wish for my patients and families to have.” Dr. Imahiyerobo went on to ask Patricia to speak at the Cleft Lip and Palate Team Day. Morgan Stanley Hospital hosted its inaugural Cleft Lip and Palate Team day this year. It was so successful that they plan to make it an annual event in years to come. The goal for this year was to focus on advocacy, outreach, but most importantly building community among patients with facial differences. To that end, the hospital chose a beach theme with brightly colored tables, a DJ, and leis and Cleftstrong bracelets for everyone. Craniofacial patients and their families were all invited to mix and mingle with Morgan Stanley Hospital medical professionals including, Dr. Imahiyerobo, Dr. June Wu, Dr. Jeffrey A. Ascherman, and Natalie Tavarez, Craniofacial Coordinator. Miss New York Teen USA, Saige Guerin, was also present for the event. Pat spoke from the heart sharing her keys to success and happiness. She told the audience of 125 people to, “Open yourself up to others and experiences. We are all different and we are all beautiful. Be kind to one another and accept people for who they are. Yes, there will be struggles and ups and downs. Continue to move forward. Put your cell phones down, look up and experience life. Realize you are not alone. 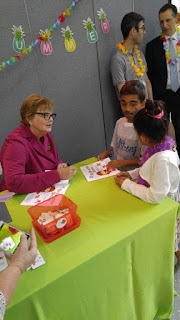 There are organizations such as CCA and the American Cleft Palate-Craniofacial Association that can provide resources and assistance for those affected with craniofacial differences.” She let people know about the books she wrote that help carry this message to children with a bright, fun cast of characters, including a cardinal named Simon, girl named Patty, and Buddy the bluebird. Later she signed copies of books that were distributed to each family at the event and listened to patient testimonials shared during the day spent together. In speaking with patients and families, Patricia talked about everything from upcoming surgeries to the gratitude they each felt in being part of the Morgan Stanley Hospital community. Way to go Patricia on spreading words of kindness, hope, and acceptance to these New York families. CCA looks forward to your future writing and speaking adventures as you advocate for all of us in the craniofacial community.